Big things at this year's Consumer Electronics Show: virtual reality, wearables galore, and the Girl Scouts! The place to be on the convention floor has definitely been the Girls STEM HQ, where attendees are learning about not only Digital Cookie, but how girls are going to lead the future of science, technology, engineering, and math. Naturally, the Girls STEM HQ is girl-led, with Girl Scouts giving demos of Digital Cookie to the crowd—and taking orders, of course! Girl Scout correspondents also interviewed top tech influencers and engineers at CES (follow this blog to see those interviews), getting first-hand knowledge on what it takes to make it in the business. Attendees have been joining the conversation on why we need to support girls looking to enter STEM careers through the hashtag #genSTEMgirls. 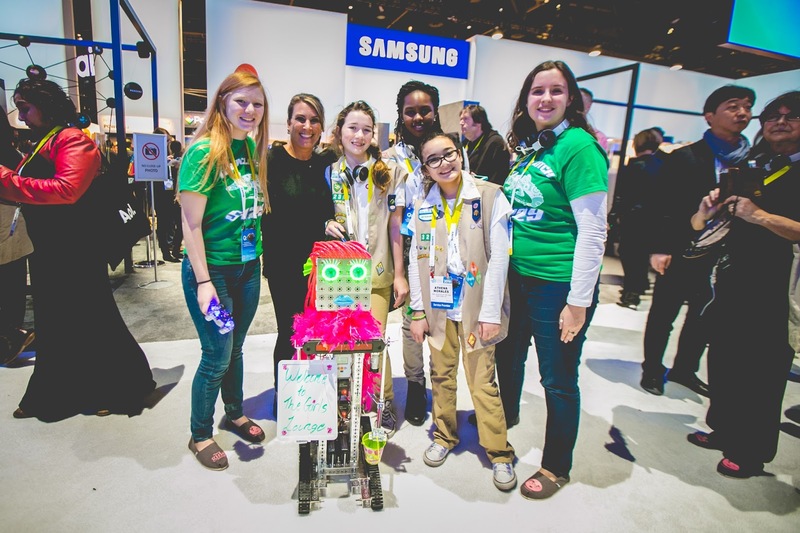 Away from Girls STEM HQ, a group of Girl Scouts and CEO Anna Maria Chávez participated in a Girls' STEM Summit at CES. The day's events included a tour of the convention floor, empowering conversations with tech leaders, and mentor sessions with top innovators cultivated through a collaboration with The Girls' Lounge. The group got a sneak peek at the latest innovations in tech with Megan Smith, the chief technology officer of the United States of America. Girls' Lounge also hosted conversations where the girls got to ask questions about Smith's career and meet other notable women in tech. The inspiring conversation ranged in topic from drones and data science to working with President Obama and Malala. Our girls didn’t hold back on the questions when interviewing influential tech veterans. Check out the first interviews below! Lance Shields, CEO of iiD, tells us about user friendly design and prototyping. Melissa Hirsch, an editor at Innovation & Tech Today magazine and a Girl Scout alum, tells us what her job is like. Jim Lichtenstein, Executive Producer of Henry Ford's Innovation Nation, talks about how his TV show discovers the latest inventions. See more videos from CES interviews on the Girl Scout YouTube channel. Join the conversation about why it's important to support girls and help them pursue STEM careers at #genSTEMgirls.